We begin the New Year with ‘Walking through history’, a new series devoted to the history of various areas across London. Over the coming few months, we will embark on several walking tours to uncover the secrets of both the capital’s landmarks and lesser known areas. In the first of the series, house-historian Melanie Backe-Hansen took me on a walk around Chelsea. From Sloane Square, down Lower Sloane Street and Royal Hospital Road, and onto Chelsea Embankment, she explained the area’s history from Anglo-Saxon times to the present. It is difficult to imagine that what is now one of London’s most exclusive and fashionable areas began as a small rural community almost 1,500 years ago. It is believed that there existed a village on the river bank, which boasted a small church on the site of what is now known as Chelsea Old Church, since Anglo-Saxon times. The church was recorded in the Domesday Book in the 11th century, as well as in a papal taxation document around 1290. 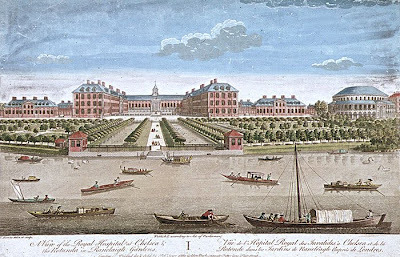 Chelsea developed extensively in the 16th century when it increasingly attracted members of the nobility and aristocracy and wealthy landowners began to build country estates and mansions on the banks of the river. There followed a second phase of major development in the 18th century overseen by Sir Hans Sloane. Two of Chelsea’s most famous residents were Sir Thomas More (1478-1535) and Henry VIII (1491-1547). Sir Thomas More lived in Chelsea for over twenty years and had a significant impact on the area’s first phase of development. In 1520, he built his house, Beaufort House, slightly set back from the river where Beaufort Street is today. He was active in the local church and, in 1528, he notably rebuilt the chapel of Chelsea Old Church, known at the time as St Lukes, in his name. (St Lukes was renamed Chelsea Old Church when the new St Lukes was built on today’s Sydney Street in 1824). It is believed that Henry VIII decided to move to Chelsea following visits to Thomas More. Chelsea was already a popular home for a number of notable families and, around 1510, Henry VIII moved to his Old Manor House, located behind the Old Church. The house was originally owned by Sir Reginald Bray in the late 15th century, who passed it down to his nephew Sir Edmund Lord Bray. In 1510, Sir Edmund Lord Bray surrendered it to Sir William Sandys, who then exchanged the house with the king for a property in Hampshire. In the 1540s, Henry VIII began the building of his New Manor House, also known as Chelsea Palace, approximately where 19-26 Cheyne Walk is today. The New Manor House was designed as a wedding present for Catherine Parr. It was the home of Elizabeth I when she was a child and its last royal resident was Anne Cleves, who died in 1557. After the English Civil War, the house was taken over by the state and was then sold to Charles Cheyne in 1660. In 1742, it was bought by Sir Hans Sloane, who lived in it until his death in 1753. The house was demolished in 1755. Henry VIII was also the first to use the Kings R oad. Until the 16th century, the road was a rural dirt track which ran along the south side of Chelsea Common and was used primarily by farmers and gardeners. When Henry VIII moved to Chelsea it became the king’s private road, which he used to travel to his Manor House by the Thames. In the 17th century, Charles II made it his private road from Whitehall to Hampton Court to avoid using the Fulham Road. George III is also believed to have used the road to travel to Kew Palace. In 1830, the Kings Road was eventually made public and was thereafter developed as a residential area. Houses and grand squares began to be built on the site of former nursery gardens and open fields. The residential squares along Kings Road are unique in London because they are mostly three-sided, with the fourth side being the Kings Road. Towards the end of the 19th century, after the building of the Chelsea Embankment in 1874, the centre of Chelsea life gradually shifted from the riverside to the Kings Road. In the 1960s, it became a centre for shopping and the heart of the London fashion scene and the last remnants of Chelsea village life completely moved away from the riverside. Another Chelsea landmark is the Royal Hospital, built in the 17th century. In December 1681, Charles II issued a Royal Warrant authorising the construction of the Royal Hospital and commissioned Sir Christopher Wren to design the buildings. The hospital was modelled on the Invalides in Paris and was built on the site of a former theological college founded by James I. The college was unsuccessful, receiving neither the support of the Catholic Church nor the Church of England, and only a few of the original planned buildings were constructed. It was closed during the Civil War. The building of the Royal Hospital began in 1682. However, due to funding difficulties, the work was not completed until 1692. The first pensioners were admitted in February 1692. 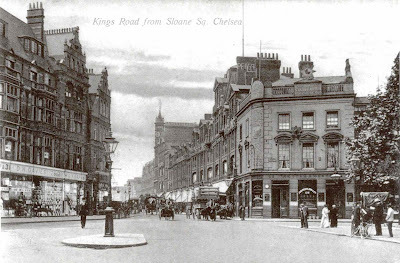 Our tour ends on Sloane Square at the heart of Chelsea and the crossroads of Kings Road and Sloane Street. The square is named after Sir Hans Sloane, who was Lord of the Manor in 1712. 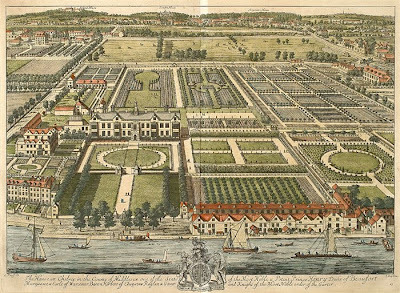 Sir Hans Sloane was largely responsible for the development of Cheyne Walk when, in 1717, he leased lands in what was originally Henry VIII’s ‘Great Garden’ for building. Despite its name, Sloane Square was largely designed by the architect Henry Holland (1745-1806) as the central feature of his 89-acre Hans Town development, built at the end of the 1770s. The area was redeveloped in the 1870s-1890s and none of the original buildings remain. The Royal Court Theatre was built in 1871 and Sloane Square station opened in 1868. Peter Jones department store dates from the same period when it began as a drapery store on Marlborough Road (now Draycott Avenue). The store gradually expanded and within five years it was relocated to the Kings Road. By the 1880s, it had further expanded to another 26 stores on the Kings Road and was rebuilt as one large single store on the corner of Sloane Square. The building was one of the first of its kind to be lit by electricity and the floors above the store were designed as quarters for the staff with facilities such as a library, piano and billiard tables. By the time of Peter Jones’ death in 1905, the store employed over 300 staff and sold everything from linoleum to squirrels and flamingos. The following year Peter Jones was purchased by John Lewis. It was rebuilt in the 1930s in its current glass and metal style known as ‘curtain wall’ and is now a Grade II listed building. It's a nice read. I'm back to uni, so will be able to catch-up interesting aspects of historical milieu, now & then from History Today. Cheers.